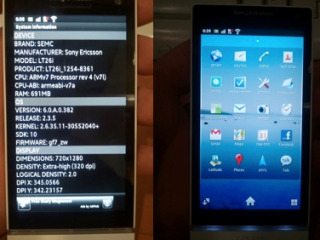 Sony Ericsson Xperia Arc HD incoming? Sony may be looking to cash in on its decent Arc range of mobile phones, with rumours surfacing that it could be readying a new handset in the series called the Sony Ericsson Xperia Arc HD. Sony announced in October that it was acquiring Ericsson's share of its phone business for a whopping €1 billion. Considering this is a company that is in the doldrums when it comes to finances – profit for this year has been slashed by 90 per cent – it wouldn't be spending that amount of money without having absolute faith in its smartphone line-up and a few interesting products up its sleeves. One of these could well be the Sony Ericsson Xperia Arc HD – or the Sony Xperia Arc HD, depending when the ink on the buyout contract is dry. The HD part of the phone is said to refer to its screen, which is said to be 720p (1280x720 pixels), and that the handset will support Full HD video recording. This type of screen resolution can already be found on the Samsung Galaxy Nexus, so it makes sense that Sony would want to add this to any upcoming handset. The Sony Ericsson Xperia Arc HD is also said to be packing Android 2.3, which we hope will get a quick upgrade to ICS (Android 4.0), with a 1.5Ghz dual core chip - appropriate given the screen and filming power that's being hinted at. According to Phone Arena, the Arc HD may well be going under the moniker of the Sony Ericsson Nozomi LT26, a handset we first heard about in September. If this is the case, then more stats for the phone include a 12MP Exmor R camera, 1GB RAM and 32GB native storage. There's been a lot of buzz surrounding the Arc line-up, so we are badging this as Quite Likely.